Five stars for the ideas, but considerably less for the collection compiled here by Haddad. I say that because they vary in quality, from pithy and impassioned to drawn out and repetitive. 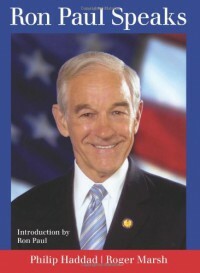 This would serve as a decent primer for those unfamiliar with Ron Paul who want to learn what he's about, as essentially all of his major beliefs are outlined by these quotes. But for someone who is already a Paulist, there's little you'll get out of it if you read it cover to cover. Maybe if you want to keep it around as a coffee table book, it will serve that purpose well.